Snacking is an important part of a diet and can help prevent overeating at the next meal. But some snacks that you think might be healthy could be hiding excessive calories, fat and sugar. Dried fruit. Although dried fruit has numerous health benefits, it is also extremely high in sugar and calories. In addition, the drying process can cause a significant loss of nutrients, specifically fiber, so this snack might not leave you satisfied in the same way a piece of fresh fruit will. 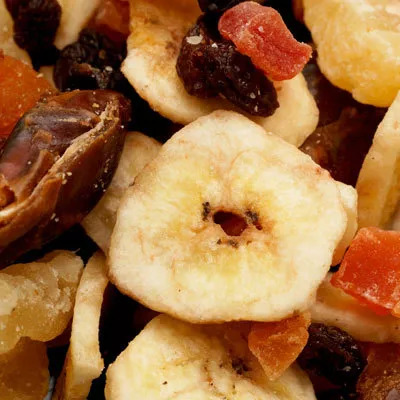 If eating dried fruit, watch portion size, but when possible, replace dried fruit with a more satisfying piece of fresh fruit. Frozen yogurt. Depending on the brand and the ingredients, there can be some health benefits to frozen yogurt, and it is a good substitute for ice cream once in a while. However, like most other foods, portion size matters. One serving is four ounces or a half-cup (which is rarely what they give you at the store) and can have upwards of 20 grams of sugar. Even if it's fat-free, the calories add up quickly. And despite its name, frozen yogurt is closer in nutritional makeup to ice cream than regular yogurt. Coffee house drinks. Be careful when choosing your mid-afternoon pick-me-up. Some of the drinks sold in popular coffee houses can be extremely high in empty calories. For instance, a Starbucks Peppermint Mocha Frappucino made with nonfat milk contains 270 calories and 61 grams of sugar. That’s almost 15 teaspoons of sugar in one drink! If you need a caffeinated beverage, try green tea with a little skim milk and pair it with a piece of fresh fruit to satisfy your sweet tooth and curb your hunger. Nuts. Nuts are an extremely healthy snack, but because they are high in calories, it is important to watch portion sizes. (Too much of a good thing can end up adding to your waistline.) Familiarize yourself with the serving size of your favorite nuts (the recommended size is usually one ounce) and pack individualized bags ahead of time for portion control. Some good nuts to keep on hand are walnuts (14 shelled walnuts per serving) or almonds (24 shelled almonds per serving). Organic snack foods. Many people see the word "organic" on snack packages and assume this means the food is healthy. However, just like any other type of snack food, it is important to read the labels and assess the snack’s nutritional value. Many organic foods, such as organic cereal or organic snack bars, can be high in salt and sugar, even sometimes higher than their non-organic counterparts. If buying organic, look for snack foods made with whole grains that are low in sodium (less than 140 mg per serving) and low in sugar (less than 30 grams of carbohydrates per serving). These foods should be low in saturated fat and trans fat as well. Samantha Linden is a registered dietitian and mother of two. Like many parents, she understands the positive impact a nutritious diet can have on a family’s overall wellness. Linden believes good eating habits begin with educating parents. She also realizes that life is very busy and sometimes the ideal isn’t always possible.